The last month or so has been a bit crazy in Newman Towers. The bad crazy – Just after we bought a “new” car and booked a little break for Elisabeth, me and hubby we heard that the company my husband works for has gone bust and it was likely that half of the employees would be made redundant. There is never a good time for news like this, but 2 and a half months before one of our incomes will be more than halved due to maternity leave and just after we, for the first time in our married life, borrowed a bit of money to buy a car to accommodate our growing family, is more than a little stressful. But long story short, he has still got a job which we are very grateful for. The good crazy – A couple of weeks ago hubby and I had a week off from work and we both thught it would be nice to treat Elisabeth to some fun time away. 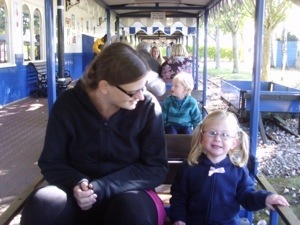 So we went to Peppa Pig World! We booked tickets for two days in the park and two days in a hotel nearby. Elisabeth had just started to understand the concept of holiday (through watching Peppa Pig funnily enough) and she was really excited even though we hadn’t told her where we were going. The day we left we all got up at 5am to try and beat some of the traffic around London and we did quite well, took us 5 hours in total to get there, and that was with 4 toilet stops. We weren’t expecting too much of the park if I’m honest and we didn’t think we would be there for very long the first day because Elisabeth was very tired. 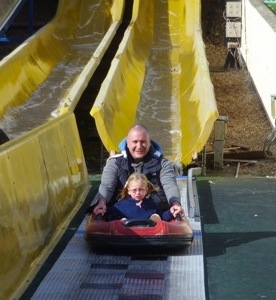 But how wrong we were, Elisabeth loved it………and so did we! 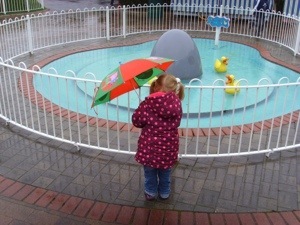 Because Elisabeth was so well behaved, on the second day she got to pick something from the gift shop, she chose a ‘George’ umbrella, which was good because it was chucking it down! All in all it was a very enjoyable holiday, Elisabeth loved staying in the hotel because she got to sleep in the room with us, which went better than expected. Unfortunately Elisabeth woke up with a high temperature on the last night in the hotel, so I sat with her for about an hour until her temperature went down and she was happy to go back to sleep. This messed up our plans to go for a swim in the hotel pool on Saturday morning, but hey, you can’t have everything. We are very pleased that we managed to get away and spend some quality time with the three of us before we will be a family of four. Sounds like a great trip! You made some good memories there! Thanks, it was quite stressful, but our trip cheered us all up. Glad husband’s job is still secure. The trip sounds like alot of fun and nice to do before new baby comes. Yes, it’s a great weight of our shoulders knowing he still has a job, and the trip was great. p.s. I wasn’t sure if his job was still in possible jeopardy or if he’s definitely okay….